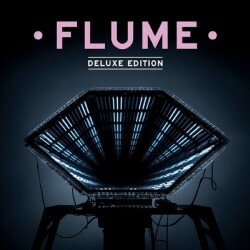 What can be said about Flume that hasn't been said already? He's a young producer hailing from the land down under, and he's been making some huge tracks that have blown people out of the water. He came out with a self-titled debut earlier this year, and he's coming out with a deluxe edition of the album on November 8th. But let's be real, you're reading EARMILK, and I'm almost willing to bet that you, as well as the rest of our wonderful readership, already knew this. Could I go on and on about how big of a name Flume is? Most definitely, but it's a bit counterintuitive. So I'm going to keep this short as possible. Flume has been releasing bits and pieces of his deluxe edition, and this week he came out with “Intro,” which features Stalley, a member of Maybach Music Group. Flume has always been a bit of a transitional guy, swiftly moving beyond genres and smoothly crossing boundaries. He's one step beyond the game, and his newest remix of “Intro” only highlights this. His re-release also features work from the likes of Killer Mike, Freddie Gibbs, and Ghostface Killah, among other great rap figures. Justice Skolnik refreshes a future bass classic in Flume's "Sleepless"